Agriculture Equipment Market size was valued at around USD 140 billion in 2017 with over 5 million units sold and will grow at approximately 6% CAGR from 2018 to 2024. The adoption of modern equipment by farmers to meet the growing demand for food supply and to increase the farm yields is predicted to drive the agriculture equipment market growth over the coming years. The industry is witnessing a growing demand for the cultivation of crops and grains owing to the rise in the global population and consumption of food items. To meet this demand, manufacturers are developing equipment that aids the farmers in simplifying several farm activities such as plowing, digging, harvesting, and threshing. Sales of agricultural products are anticipated to rise at a high pace in several developing markets owing to the growth in population, economic, and per capita calorie intake. These factors are also anticipated to facilitate the expansion of processed food & beverage sector in industrializing countries, thereby driving the agriculture machinery market. With the increase in the local demand for agricultural supplies, farmers are anticipated to replace outdated machines and invest in new equipment to boost output and enhance the productivity and efficiency of their operations, thereby causing a rise in the Average Selling Price (ASP) of the machinery. Food producers are replacing legacy machinery with more powerful and larger models due to the rise in farm incomes, providing an impetus to the agriculture equipment market. Farmers in countries including China, India, and Brazil can gain access to the capital needed to invest in large-scale crop production, thereby adding to market value gains in these countries. Several modern machines are being developed by the manufacturers with the integration of advanced technologies such as drone monitoring and wireless soil probe. Moreover, IoT-based smart farming is an emerging trend witnessed in the agriculture machinery market as it provides remote monitoring and control of several cultivation processes and records the data related to it. Agricultural machinery comprises a wide range of equipment and tools that are used in various farming processes to enhance the crop quality and improve output. In the agriculture equipment market, farm tractors accounted for over 50% of the market share in 2017. Technologies, such as auto-steer mechanisms, GPS tracking, and radar system, that help in preventing collisions are generating a high demand for these products. In the industrialized countries that are already intensive users of the equipment, gains in the product sales over the coming years are being largely stimulated by the replacement demand. The introduction of expensive models that comply with new emissions standards is aiding in spurring the equipment replacement demand in these countries. Moreover, factors, such as access to financing, economic environment, and manufacturing & usage of advanced models, are positively impacting the agriculture machinery market. Farmers are replacing outdated machines and tools with various new equipment such as drip irrigation and crop processing equipment. The agriculture equipment market is anticipated to witness a rise in adoption of agrochemical products, such as pesticides and insecticides, for protecting the crops from worms and insects. Special types of tools and machines are being used for protecting these products. Moreover, the industry is witnessing a rise in the application of harvesting machinery for gathering mature crops from the field. These machines perform several functions such as threshing, cutting, and winnowing. They also provide automation in several farm processes, which is simplifying the tasks performed by the farmers. The integration of cameras and global positioning sensors in these machinery is providing automated multitasking and monitoring functions. The U.S. agriculture machinery market is experiencing a steady growth owing to the adoption of automated products and high labor costs. In 2017, Asia Pacific was worth over USD 60 billion in the global agriculture machinery market and is growing at a rapid pace owing to the growing demand for the machines from the food & beverage producers. Several government initiatives, programs, and policies are being developed for the benefit of farmers, which is encouraging the production and cultivation of these food products. Mechanization of the farming process is rapidly advancing in several countries including China, India, Japan, and South Korea, Thailand and Vietnam are providing several opportunities for the manufacturers to expand their presence and reach the untapped markets. The Made in China initiative is encouraging the domestic production of the products, thereby driving the cultivation and farming activities of the country. 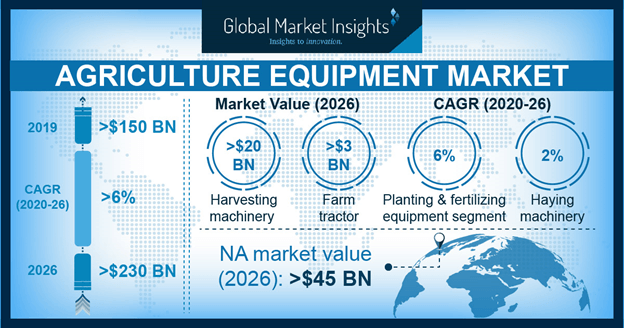 Government initiatives and grants in the Asia Pacific and European region to support agricultural development are driving the agriculture equipment market growth. These initiatives are allowing farmers to invest in technologically advanced equipment and attain high productivity. For instance, the Indian Government introduced several schemes and programs for the farmer’s welfare as agriculture is a key business in the country. The government is helping farmers with the provision of raw materials at lower rates, loan availability for purchasing machines, and capital fund schemes. The ease in the usage of complex processes and low pricing of machines are driving the Indian agriculture machinery market. 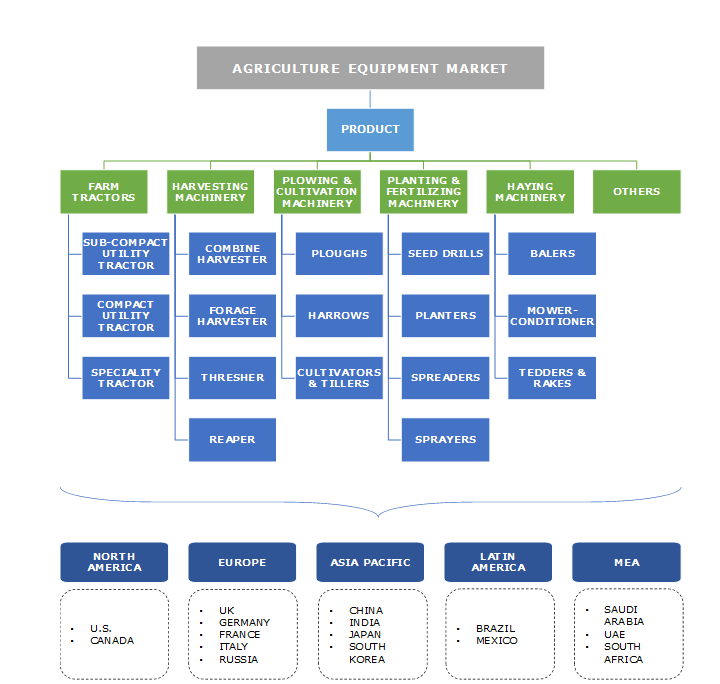 The key players operating in the agriculture equipment market are ARGO SpA, AGCO Corp., Alamo Group Incorporated, Bucher Industries AG, CNH Industrial N.V., Claas KGaA mbH, Escorts Group, Deere and Company, JCB Limited, Foton Lovol International Heavy Industries Company Ltd., Kuhn Group, Kubota Tractor Corp, Mahindra & Mahindra Ltd., Landini, Netafim Limited, Valmont Industries Incorporated, Tractors and Farm Equipment Ltd., Yanmar Company Limited, WORLD Group Company Limited, and others. These companies are offering several products in all the regions. Manufacturers in the industry are highly focused on developing products that incorporate recent technologies such as GPS, satellite sensors, and Google Earth. Companies are developing new technologies in the agriculture equipment market, which are providing them several opportunities to offer their products in the regions where a high demand for the equipment can be witnessed. Moreover, the integration of smart technologies to provide automated products is aiding the companies to achieve the revenue growth. These technologies include smart and connected farming, which provides mobile connectivity of the equipment such as driverless tractors, automatic watering & irrigation, and drones for imaging and planting, and real-time monitoring and analysis. The incorporation of these technologies is driving the competition in the agriculture equipment market. The players are targeting their products in the countries including the U.S., the UK, France, China, Japan, and India where high demand and adoption of these smart technologies is being witnessed. The entry of unorganized players and the rising demand for used machinery are restricting the agriculture equipment market growth. High costs of the new machines are encouraging the small farmers to purchase used equipment from the unorganized sellers. Several government administrations have developed policies to provide support to the farmers in buying new machinery. For instance, the government of India implemented Interest Subvention Scheme (ISS), which provides short-term loans to the farmers at a minimal rate of interest. These schemes and policies are inspiring the farmers to take advantage of the loan facilities for purchasing machinery, thereby propelling the agriculture machinery market. The adoption of the automated farming machinery is providing several advantages to the farmers, such as safety, accuracy, enhanced productivity, and efficiency, thereby driving the agriculture equipment market demand. This automated machinery is reducing the costs of labor that are employed for performing several activities in the farm. Machinery required for manufacturing chemicals, such as pesticides and insecticides, are experiencing a high demand. The manufacturers are integrating effective and smart technologies into these machines to ease the difficult activities performed by the farmers such as IoT, remote monitoring & control, automation, GPS, and mobile connectivity.